Hi there! So, for a little background I think it's fair to mention that i'm very very new to secondlife and always open for advice. So if you have critiques on anything: advertising, pricing, ANYTHING please do let me know it'd be very appreciated! Here are some ground rules: ☾ Be specific when you fill out the commission form. ☾ Try to provide the best pictures or references you can, it's difficult to go off of explanation alone. ☾ Be patient! Waiting time can be anywhere from 2 days to 2 months. ☾ You may edit or change your art in any way after you receive it, it's yours to do as you please just remember to credit me when asked by others. 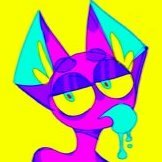 ☾ I do absolutely any species, this includes furries, humans, feral animals, and any other creature you can possibly think of. ☾ Don't be afraid to tell me to fix something, I want you 100% satisfied so feel free to be picky. For now, I only accept Lindens as payment since i'm trying to establish myself on the game. Paypal will be accepted later on. Now that that's out of the way, here's the pricing. Fullbody: 3765 L$ ($15 USD) Halfbody: 3012 L$ ($12 USD) Headshot: 2008 L$ ($8 USD) Examples of my art can be found on my DeviantArt gallery: https://regalities.deviantart.com/gallery/ Form Username: Commission Type: fullbody, halfbody, headshot Reference/Screenie: Description: Other details: You only have to pay AFTER you've approved the sketch, I will not finish the piece until after you've paid me.